Lens is clean and looks good. I could not get it to fire. It might need a battery. All leather is intact. The shutter sounds and appears accurate at all speeds. The mirror appears unmarked. A number is lightly engraved on the base plate. One Original Leather Case. Excellent condition from a collector's estate. Clean and properly stored but untested. Let me know if you want more photographs or a Hands-On video demonstration or any questions answered. I'm confident this is a great shooter but I'm not a photographer, I'm merely using my observations to pass along the condition of this beautiful artifact and assure you that I only acquire the finest items. Thank you. The overall condition is AS-IS. I’m not a vintage camera expert. I’ve had this camera I bought at a garage sale sitting on the shelf for 10 years. It appears to function properly and is in great condition (although I have not used/developed film in it). I have not cleaned it much as I don’t want to go about it wrong or deny an enthusiast their opportunity to do it right. It only has dust collected on it. Please contact me with questions. Camera is in good cosmetic condition. Camera will not wind nor fire. Lens is in good condition. Case is in good condition. Please send inquires for more information. Kine Exakta "Pre WWII" (Version 1.2.2 1938-40 ) Serial No. 532114. WithRare Zeiss Biotar f:2 58mm. Serial No.2093412. The Superb Zeiss Biotar lens is in excellent condition. The iris blades are clean and open and close smoothly. Great Vintage CARL ZEISS Jena Tessar 2,8/50 T 3973768. Camera Lense. It is in really good condition smooth and clear lenses. Email if you have any questions. Look at photos before you buy. No returns. Shipped with USPS. Made in Japan. Minolta Lens 1:1.9 f=55mm MC Rokkor-PF. Vivitar 52mm Skylight (1A) lens filter. Vintage German SLR 35mm film camera Exa 500 Ihagee Dresden . Used but appears to be in very good condition. Have not tested but shutter works and body appears to be in great shape. Over all in great. BODY STAMPED DRESDEN. VIEW FINDER MARKED IHAGEE. LEATHER CASE HAS BEEN REPAIRED. ONE EXTRA EXAKTA PRISM FINDER WITH LEATHER CASE. AUTO ARAGON 1:3.5 F=200MM LENS WITH CAP. Lens: Carl Zeiss Jena Tessar 1:2,8 50mm Serial Number 3256938. CANADA, Australia, Belgium, Brazil, Croatia, Denmark, France Germany, Great Britain and Northern Ireland, Israel, Netherlands New Zealand Spain and Switzerland, Estonia, Finland, Gibraltar, Hungary, Italy, Latvia, Lithuania, Luxembourg, Malaysia, Malta, Portugal, and Singapore. § Engraving on the top plate: Ihagee Dresden. 5 glass magnifying lenses. § Lens release: lever on the lens flange. § Re-wind release: near the cocking lever. § Re-wind knob: on the left of the top plate, on the shutter speeds dial. Nikon F3 Camera Body s/n 1871592 Paint worn on the edges Dent on top of the prism piece View finder needs cleaning Focusing screen has some dust type K Leather piece beginning to peel at 3 corners Shutter curtain looks to be torn but has been crudely repaired Light meter LCD is responsive Timer light works Shutter fires at all speeds Low shutter speeds are consistent. Higher speeds were not tested. New battery included! NIKKOR 200 mm f4 (AI) s/n 673813 Good diaphragm action Some interior dust No fungus Includes caps NIKKOR 50 mm f1.4 (AI) s/n 4378752 Good diaphragm action Exterior body wear Scratches on rear element fine lustrous dust inside lenses Untested, may need restoration Includes caps Estate sale item. Camera and lenses were not tested with film. Please ask if there are any questions. VINTAGE NIKKORMAT NIKKOR NIKON FT2 35MM SLR CAMERA ORIGINAL MANUAL NICE BLACK. THE CAMERA WORK AS SHOULD AND VERY CLEAN FOR THIS AGE. PLEASE LOOK PICTURES FOR DETAILS. Shipped with USPS Priority Mail. LUDWIG PERONAR 1:2.9 50mm LENS, PLUS EXTRAS. It is a F1:3.5, 135mm lens. See photos. The lenses and viewfinder are in good shape, no issues. All speeds operate. There are signs of leather repair by previous owners. Enlarge pics for more detail. No Handling Fees. From a local estate. The optics are clear. The case is missing the leather strap and it has scuffs and scrapes but it is fully functional. Sears 1000MXB 35mm Camera. Rebranded Mamiya MSX 1000. Works perfectly. All speeds seem accurate and meter works. Clean 28mm screw-mount lens. Some wear to the black paint. 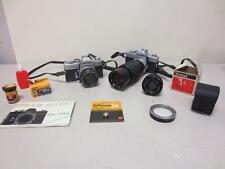 Good addition to your collection or a great beginner 35mm camera. Ready to use out of the box. Feel free to ask any questions and please see my other auctions for more vintage photo goodies. After installing new battery it seems work correctly. Serial number: 188458. ALL ARE IN GOOD CONDITION. ONLY TESTED SHUTTER SWITCH, WORKS AND ACCESS DOORS ALL OPEN PROPERLY. NICELY LINED CASE. Ihagee Dresden Exakta VX and waist-level finder. Isco-Gottingn Isconar f:2.8 50mm lens. Fires, advances, speeds sound okay. Not film tested. SEE ALL OF OUR NO RESERVE. WOULD MAKE A GREAT ADDITION TO ANY COLLECTION. IN NICE CONDITION SHOWING WEAR AS PICTURED. Top-of-the-line Praktica camera from the late 1970s/early 80s. Takes any M42 screw-mount lens. The design I can only describe as Brutalist or typical for the German Democratic Republic. The nubby rubber skin is strange but in good shape, not peeling anywhere. Camera seems to be fully working though I've never tested it with film. Not sure about the accuracy of the meter but batteries/battery adapters are still available. All in all a very solid camera that can probably still be used. Plus it's an interesting Cold War artifact. Note: Light seal strip by film door hinge needs to be replaced. Thanks for looking. The filter is not included in the sale. Lens looks good to my eye no scratches or marks that I can see. Vintage Sears (Ricoh) SL9 SLR Camera 50mm Rikenon f2.8 Lens Nice! Nice condition, shutter works at all speeds, aperture stop down action is correct, lens is clean and clear, viewfinder is clean, focus is accurate. Made by Ricoh and sold by Sears. (1) The late F-1 body is in near mint shape with only very slight rubbing marks on rear top plate near the serial number. The first and second shutter curtains are clean without wrinkles. The included F1 Manual is in Excellent Plus condition. About working condition: advanced lever and shutter works, but cannot quarantine any accuracy, because do not have the battery to tested. Battery area clean. Nice addition to any collector. Untested selling as parts or refurbish. Olympus OM-2 with Zuiko 50 MM lens and Olympus Zuiko 75-150 MM lens. Instructions Manual. T20 Flash Camera Bottom and flash does have engraving shown in the pictures. Body shows minimal wear. Everything functions. Shutter sounds correct but has not been tested for accuracy. The shutter, focus and iris work however it has not been film tested. Optics are clear. Great beginner's film camera. Compatible with a huge variety of screw mount lenses. Handy split-image focusing aid in viewfinder. Everything works well but not film tested. Light seal strip by door hinge should be replaced. Voightlander Bessamatic Color-Skopar X 1:2,8/50 Camera w/Heiland Tilt-A-Mite Flash. Comes with Instruction booklet and cases. Camera case missing front label plate. Camera appears to have been well taken care of...very clean unit and lense. Number has been engraved on back camera body. I have never used or tested so selling AS-IS SALES FINAL. C1956 ZEISS IKON. CONTAFLEX IV. As shown, the body has the serial number L51696. 2.8 50mm Lens Hard Case. 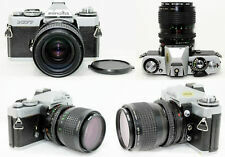 This is an Exakta II with original Schneider Xenon 50mm f/2 lens. Collectors call this a version 2. The body was made In Germany in 1949. Body Serial number 668239 The lens was made in Germany in 1949. Good shape, clean, solid, working well(shutter, advancing film, back door), lens in and out good. I am not an expert, sold as is. Vintage cameras offer the technology of a bygone day when single-lens reflex (SLR) was the dominant type of camera in use for professional and hobby photographers. Buyers sought the highly regarded makers of precision instruments and fine lenses. These manual and automatic devices required creativity both behind the vintage SLR cameras and in the photography darkroom. What is an SLR vintage camera? The single-lens reflex design differed from earlier types of vintage cameras that used a sighting lens for viewing the scene. The SLR lets the user look through the lens and see the scene before capturing it. The SLR uses prisms and mirrors to reflect the view of the scene through the lens. You can see what you can capture when releasing the shutter. When you snap the picture, the mirror moves aside, and the light image passes through the lens and strikes the silver oxide film to create the photo image. How do you use vintage SLRs? The modern digital SLR offers the user the instant gratification of seeing the picture. Vintage SLR cameras do not provide an immediate result. You must develop the images and print the negative to see what you captured. You can pick between a 35mm format and larger formats. While a medium format has more detail than 35mm, most SLR cameras use the 35mm format. What are some features of vintage SLRs? Interchangeable lenses allow the SLR to work with big lenses like celestial telescopes. Automatic or manual settings for shutter speed and aperture let the user control the amount of light that enters the camera lens. Autofocus systems make shutter and focus settings based on the objects the sensor detects. How do photographers develop their SLR photos? You can send filled SLR film rolls to a developer service. Some office supply, drugstores, and department stores offer developing services. Many companies perform developing online and by mail. Additionally, you can use a basic darkroom for film developing services, whichever is more readily available and convenient. What are some advantages of SLR photography? The SLR lets you see what you can capture. The shutter release has a fraction of a second in latency. While some models shift to a full auto mode easily, other cameras have automatic functions that provide elements of a simple point and shoot model with no need to make further adjustments. The versatility of analog SLRs includes specialized lenses and filters that can add effects and improve photos in bright or low-light conditions.